In the medical field, ophthalmology is one of the most competitive areas of study. For students looking to start their medical residency, this means that getting into best ophthalmology residency program can be a challenge. In order to get accepted students must submit an application that will get the attention of admissions boards. While there are several components that make up a student’s admissions package, one of the most important components is the personal statement. However, despite its importance the personal statement is also what gives most ophthalmology residency applicants the most trouble. We understand the difficulties in creating these personal essays which is why we offer professional and personalized residency personal statement writing services to help medical students with this process. John Hopkins University: Wilmer ophthalmologists are seen very much as being some of the best in their field. This residency offers two teaching hospitals and a wide-ranging population of patients. University of Iowa: the university offers a three year ACGME accredited program and looks after more than 60,000 patients every year. Harvard University: this premier teaching institution will provide you with a comprehensive program of training through 6 different teaching hospitals. Duke University: this is a three year course with many final year students able to work in many places around the world. 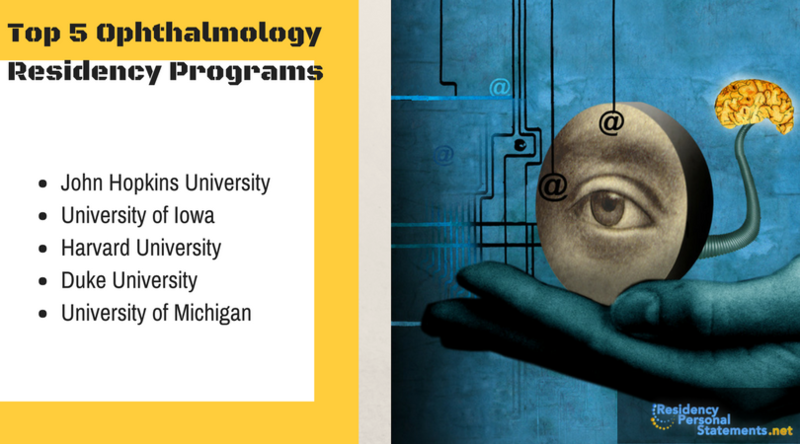 University of Michigan: The Kellogg Eye Center provides training for just 6 residents every year but you can be sure that you will receive some of the best training in the world. What Should You Be Covering in Your Ophthalmology Residency Personal Statement? Your reasons for selecting ophthalmology: provide the reasons for your following this specialty and what you have done to date to pursue this interest. This section should clearly show why you are going to be an ophthalmologist. Why you are going to be a good ophthalmologist: explain the skills and qualities that you have that are going to make you an excellent resident and future specialist. What do you want from your residency? Explain what it is that you are looking to learn from your residency from soft skills to specific experience. Where will your career take you? They will want to see that you have a clear understanding of where your career is heading after you have completed your residency. Do not talk about how your rare eye disease got you interested in ophthalmology because admitting such a disability can greatly handicap you in a very visual specialty and may cause programs to hesitate when considering your application. Creating personal statements to get into ophthalmology residency programs requires a great deal of focus and concentration, but it also requires a basic knowledge of what a personal statement should include. Top residency programs will be very particular about the personal statements they receive and will look for a number of things in their applicant’s statements. The ophthalmology residency personal statement should be interesting to read, share life experiences and also talk about the program the student is applying to. The statement should be personalized to a specific program and explain why the student would be successful in a program, beyond what is listed in the resume. Students must be able to create this type of document all while making sure it is completely error-free and well written. Doing all of these things is challenging, which is why we are here to help. 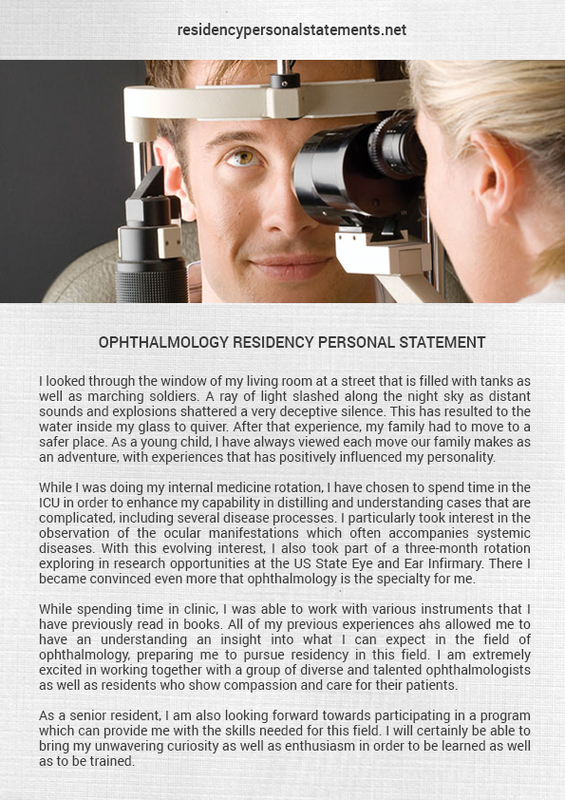 Your ophthalmology personal statement is one of the most important parts of your application package to a residency program. We understand the weight that this document holds, this is why we only pair you with professional residency personal statement writers who have years of experience in their industry. We will also be sure to match you with writers who have the necessary medical background and understanding of this rigorous application process to provide you with a statement that fits the needs of admissions boards. Ability to adjust your statement to the program requirements. Perfect structure of the statement. 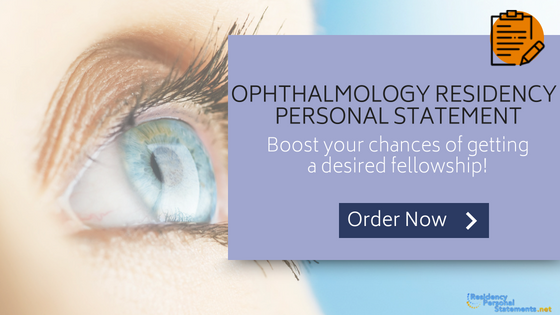 With our professional help you can get an ophthalmology residency personal statement that will help you stick out from a sea of qualified applicants. Our services are top-of-the-line and we not only provide you with professionally written documents but we also back our premium quality residency personal statement services up with expert customer care, to make sure you are completely satisfied. Contact our specialized services here today to ensure that you get all of the help that you need to submit your highly impressive ophthalmology residency personal statement.